Victor Shade > Blog > Why Choose Motorization For Your Home? At Victor Shade, we are passionate about helping you find the perfect window treatment for your home. That’s why we spend so much time educating you about the different options we offer, as well as encouraging you to visit our Showroom to see these treatments in action. PowerView™ is for when you want the Pebble remote, or all the bells and whistles like compatibility with your smart home device like Alexa or Google Home. SoftTouch™ is an excellent choice for people who want motorization that is budget friendly and do not prefer full motorization like PowerView™. To use, simply pull up or down on the attached wand to raise or lower your blinds. It’s that easy! If you have children and pets in your home, you know that loose window shade cords can pose a danger to them. To eliminate this risk, motorization is an excellent solution. Since motorized shades like SoftTouch™ and PowerView™ are cordless, you are removing a danger from your home. With motorization, you are in control. Went on a trip and forgot to close your window treatments? Need to open them for the sitter? Thanks to the PowerView™ mobile app, you can control your shades from anywhere. Wake up and go to bed at the same time each day? Simply program your PowerView™ shades to open and close with the rising and setting of the sun. You can also program them to close during the hottest part of the day to help save on energy costs. If you have windows in your home that are tall or high up, motorization is highly recommended for these. That is because opening these treatments by hand can be very difficult. PowerView™ Motorization allows you to easily open these hard-to-reach treatmentsm. 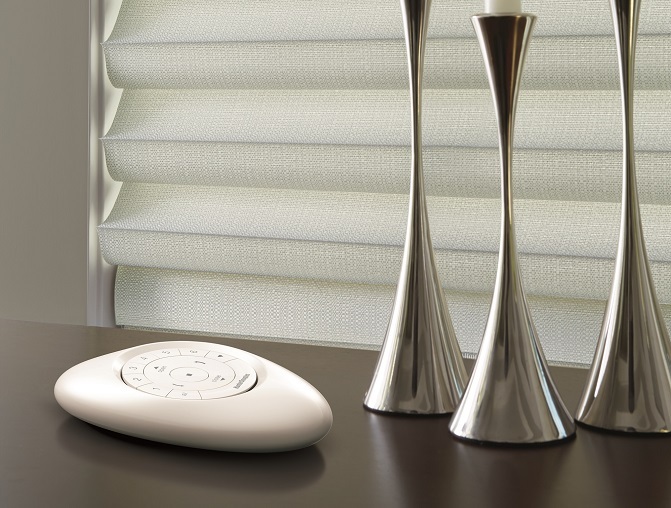 Motorization can be paired with almost any shade we offer, and can even be used to tilt your blinds or shutters. If you have a smart home system like Nest® or Amazon Echo, motorization can be seamlessly integrated with them. Then, you can open and close your window treatments with just your voice.